Travel Blog: A brief tour of Crete and Athens | Shut Up Hamish! There has been a lot discussed in the media recently about the economic crisis in Greece – making it seem not the most appealing of holiday destinations. No doubt statistically, the country is not in the best state. Unemployment has reached 26% this year, thousands are homeless and 20% of shops in Athens are empty. Does this make it wrong to visit such troubled country for recreational purposes? On the surface, maybe so. But upon visiting Crete and Athens recently, I did not encounter a hostile and unwelcoming environment. In contrary, locals were welcoming and our experiences were nothing but positive. Greece is beautiful, and even if only visiting for a short few days as I did – you’ll find a lot of take away. My itinerary was irrationally rushed. After finishing work on a Wednesday, I departed London to arrive on the Cretian city of Heraklion at two in the morning, their time. I was to spend two days in Crete, before flying Friday night to Athens. After a sleep in a backpackers I would have one day and night in Athens before flying back to London, with a day stop over to explore Rome on the way home. I would recommend spending a great deal more time in Greece, particularly Crete. There is a lot to take in and I only scratched the surface. I managed to see plenty of the ruins and historical sites, but something had to be sacrificed – in my case this was the beaches. Coming to the end of Summer this was not necessarily a terrible thing – I did manage one swim at a great spot just outside our Air BnB accommodation at Amoudara, yet if I am to return, I would most definitely make more of the Mediterranean sea. 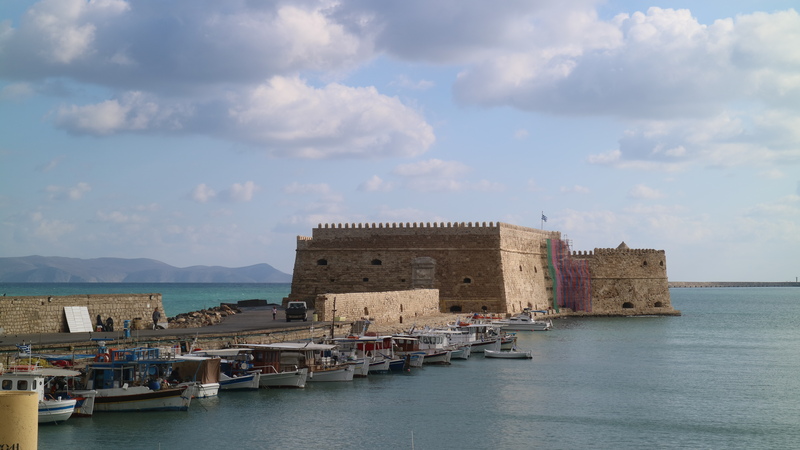 On my first day in Crete we hired a car at a discount price, and set off to explore the streets of Heraklion and drive the coast to the seaside town of Elounda. Before the leaving, we were given some insight into life on Crete, with the owner car rental business explaining to us that the depression had not hit Crete as hard as mainland cities such as Athens, due to the still booming tourist trade. We did however get a nice discount on the car hire price, perhaps due to it being the end of tourist season and to entice business in that bit more. If you do head to Greece at the right time, you’ll find it fairly affordable, accommodation as well as food and drink. 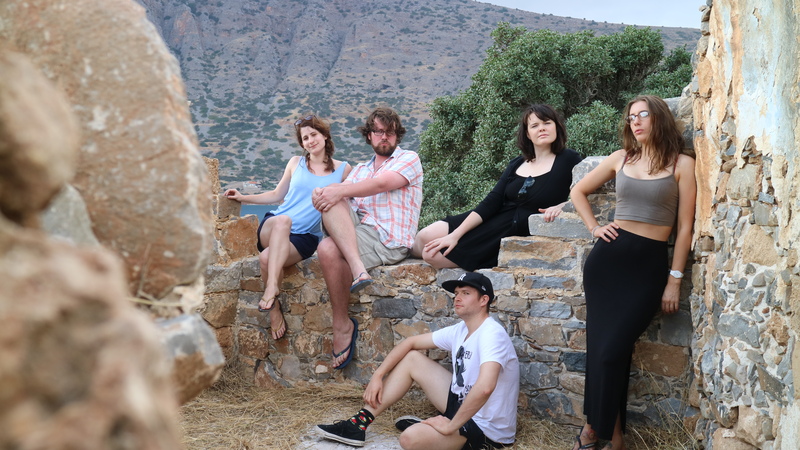 A flock of Kiwis with no previously experience driving on the right side of the road and in completely foreign country was probably not the most responsible group to be hiring a car, though we somehow we made our way from Heraklion to Elounda on the east coast in one piece. This was a great experience in of itself, tackling the aggressive Greek traffic while cruising past some amazing mediterranean vistas. Once at Elounda we took a boat over to Spinalonga island, home to ruins of a 16th century Venetian military fort, and which was used as a leper colony in the early 20th century, before being abandoned in the 1950s. The ruins are fascinating and some good climbing is to be had. The town of Elounda is a charming seaside community in of itself with some nice restaraunts, and apparently beaches nearby. 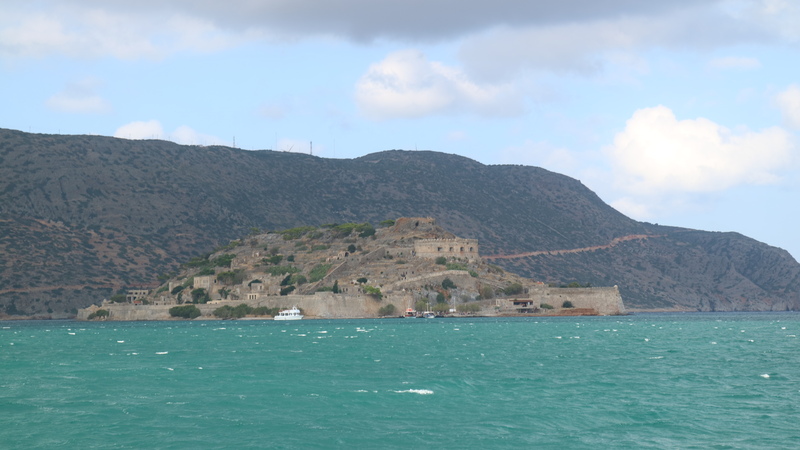 We did not stay long however – with Spinalonga taking up most of the day the sun was soon setting and it was time to return to Heraklion. Back in Heraklion we stopped at our accommodation before heading out to dinner. A friend attempted to have a hot shower – in order to do this the hot water had to be turned at the main switchboard, as all water is heated by solar panels in Amoudara. The wrong switch was flicked at the mains, blowing the fuse in our accommodation and cutting off all electricity to the dismay of several of our group. With our cellphones needing a charge before the next day’s adventures – stress levels were about to run high. This potentially awkward situation had silver linings however, as the incident served as a glimpse into the generosity of Cretian hospitality. Several of the neighbours gathered to help fix the blown fuse – and going out of their way, eventually taking a fuse out of their houses and installing it in ours. Due to a significant language barrier, it was not immediately apparent how he had fixed our fuse board – until we looked in the corridor and saw his house, the apartment across the hallway from ours. His wife was standing in his doorway, in the dark, holding a candle. He had sacrificed power for his own house in order to fix the outage we had created in ours. A touching scene you couldn’t stage if you tried. We were taken away by this hospitality – we thanked them as best we could and a bottle of wine and chocolates were bought for the man and his wife. We hope they shared it and forgave our New Zealand bluntness, as we left with our tale between our legs and resumed our previously plans of heading to a cretian restaurant. My friends had been in Crete for several days before I arrived and had developed some connections with the locals – the restaurant we visited that night becoming their local. At the time I was unable to decipher the name of the restaurant, being in Greek text, but I’ve since found it on trip advisor. It’s called kritiki Spiti and can be found here http://www.tripadvisor.co.uk/Restaurant_Review-g670533-d2446337-Reviews-Kritiki_Spiti-Amoudara_Crete.html#photos. They had brilliant Cretan cuisine and introduced us all to a fantastic local drink – Raki. Raki is similar to vodka or tequila and works well with cucumber and a hint of lemon – a cocktail known as a Rakitini. I would say a visit to Crete is worth it for sampling the food alone. Restaurants will bring out complimentary bred, olives, cheese and dips before you’ve even ordered. Of the mains we tried, the Lamb and Artichoke was a big hit, Rabbit and Goat meat being on the menu as well, worth it if you’re willing to experience outside the usual meats. On the day of our group leaving Heraklion, we walked past the restaurant that became my groups favourite, waving goodbye to the old man who worked at and perhaps owned the establishment. He called us in, offering us a bottle of home brewed Honey Mead as a gift (which would later drink by the docs at Chania). His humour was a little controversial by Western standings, with flirtatious jokes aimed at my female friends being the standard, but this was taken to be in good humour rather than sexual harassment, with the culture and generation gap being the excuse. In another example of Cretan hospitality, a taxi driver for example went out of his way to take me on a little tour of Heraklion where I stayed the first night, stopping for 40 minutes as I visited Knossus but charging me not a terrible amount extra to take me afterwards to the Venetian fortress at the harbour entrance. I gave him a tip – and yes the taxi still cost significantly more than public transport, but the conversation with a local of Heraklion seemed well worth it and more than I would have gained from a cheaper bus ride. My time in Crete came to an early end, with a plane to Athens to catch on only my second night on the island. 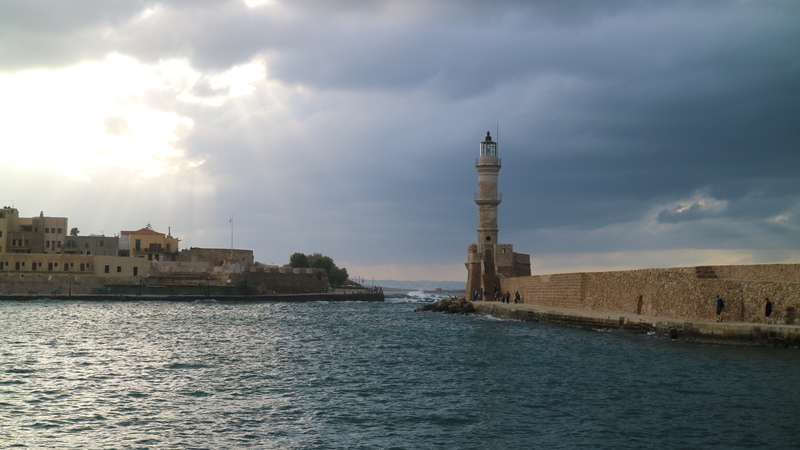 We had to catch the plane from Chania, the other major Cretan city, which had a larger and more organised vibe than Heraklion, and another spectacular wharf fort area, compliments of the Venetians. After hanging out of the pier, making friends with local stray dogs and getting a buzz going from the Honey Mead and Raki, the airport called and it was time for the mainland stage of the adventure. I have equally good things to say about Athens, even though my time there was criminally short. Athens is for sure faster and bigger than Crete, and the failing economy makes itself apparent in the amount of graffiti and the general level of cleanliness. That is only surface observations, but I was not in Athens long enough to gain any deep understanding of the situation there. My first impressions involved the tube ride out of the airport, which seemed an organised public transport system not dissimilar from London’s. The Greek government had obviously pumped some funding into this. Once inside the city we headed straight for the backpackers as this was now night-time, stopping first to get a snack. A pastry feta and spinach option was my choice, which seemed a suitably Greek choice of fast food. Athens smelt pretty bad, or at least our area. Kind of like piss, to be precise. So rather than hang around this not so great smelling city square, we opted to sleep in preparation for the next day. 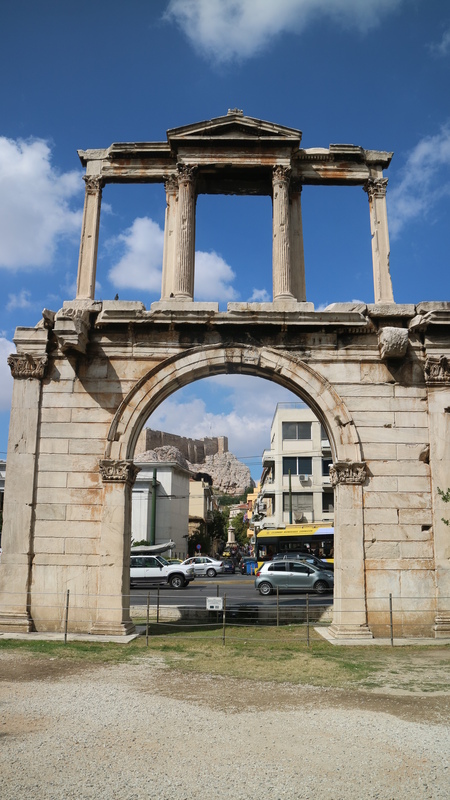 For our one complete day in Athens, we chose to begin with a free walking tour of the city, which took us by the monuments and back alley areas and gave us an understanding of the city and it’s history packed into a brief few hours. It was a good introduction and exposed us to parts of the city we would not have thought to visit, such as the museum for Melina Mercouri. Our tour guide, who was a high school teacher, part time studying for a History PHD and taking tours on the weekends, shared his own insight into Greek politics and society, taking us not only to the old monuments but also to the Tomb of the Unknown Soldier to watch the changing of the guards. The guard tradition was not particularly moving, though our guides insights into the currently political zeitgeist, with far right parties of fascist comparison gaining traction. He seemed dismayed that Greece, the birthplace of democracy, would be continually plagued by un-democratic political influence. We tipped our guide and were then left on our own to explore the city. Getting stuck into the ruins, we managed to tick off several of the main areas. 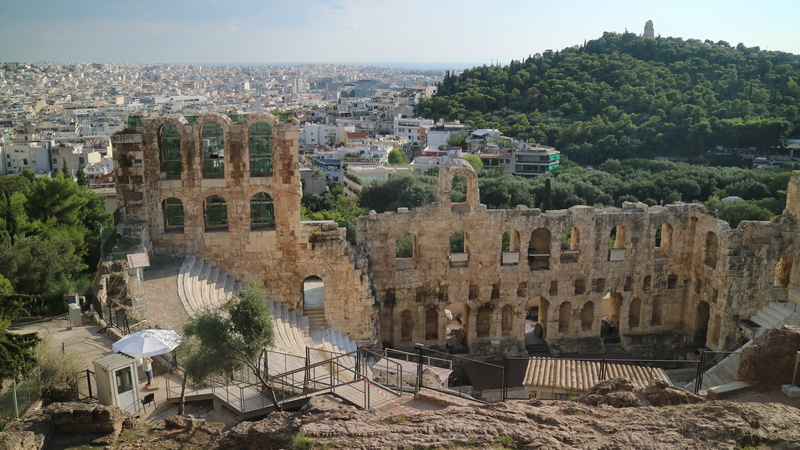 These included the massive columns of the Temple of Zeus, the impressive remains of the Temple of Hephaestus in the Agora, a brief visit to the Archeological Museum of the Athenain Agora and then of course, the Acropolis. The Acropolis is particularly spectacular and with to see such old structures still in any condition at all is a transcendent experience. Sitting up there, looking at the Parthenon, one could only imagine how powerful and dominating these structures would have appeared to the peasants down below, three thousand years earlier. The gods must really have appeared to be watching over the city. Exhausted from the sightseeing, we briefly rested at our accommodation before heading out for one last Greek dinner. The authentic restaurant we stumbled upon had a musical theme, with some seriously good Greek folk musicians jamming just beside where we ate. The food was good, perhaps not great, but the entertainment was excellent, completed with a waiter smashing plates and throwing napkins in appreciation. If you’re ever in Athens, the restaurant was just off the city centre and called “Taverna tou Psirri”, it can be found on trip advisor here http://www.tripadvisor.co.uk/Restaurant_Review-g189400-d1503450-Reviews-Taverna_Tou_Psirri-Athens_Attica.html. We invited all our new friends gathered during the early walking tour to join us, and the meal was thus extended with more and more drinks ordered. As we all had early flights, rather than sleep we opted to stay out exploring Athens some more, and consuming a few more beverages. This basically ended up with us all on the roof of a backpackers, talking smack and staring at the Acropolis in the distance. Perhaps an image that will be burnt into my mind for some time, contributed self-indulgently to the fact I turned 26 earlier that day. The next morning I dragged my half-alive self back to the airport, not quite ready to say goodbye to Greece but being forced to due to a pre-booked itinerary. I had organised a stopover in Rome but in hindsight this time would have been better spent exploring Athens that bit longer. I spent an afternoon exploring Rome, but I had left my heart in Greece. For now, I will be an advocate of Greece over Italy as preferred holiday spot, but of course I will have to explore both in more detail later. 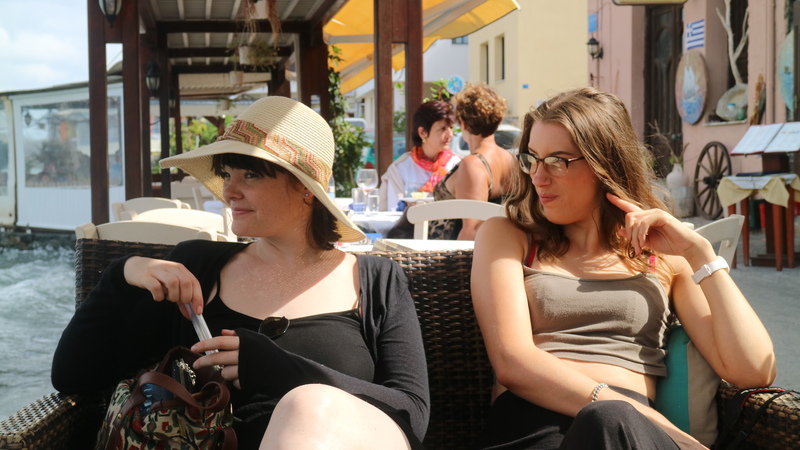 TL;DR – Crete as we experienced it is a warm, varied and culturally interesting place. Athens was equally awe inspiring, with the obvious draw card being the share amount of Ancient ruins, some still in good condition. The locals we encountered in Athens were communicative and friendly, local customs are full of life and while there is some poverty most people seem to be getting on with their lives and the overall vibe is safe. I would encourage people to visit Greece – inject your holiday savings into their economy and learn more about what this historic Mediterranean nation has to offer.